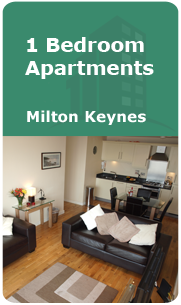 Are you looking for accommodation in Milton Keynes? 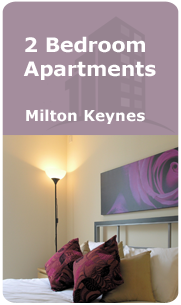 There are a number of options when looking for accommodation, but if you prefer flexibility, your own catering options, space and privacy then short stay apartments in Milton Keynes may just suit your requirements. 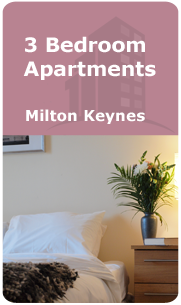 Whether it is for a leisure break, business travel or you are relocating and looking for temporary accommodation, a serviced apartment will offer home from home comforts, flexibility and privacy to make your stay relaxing. 3. Offers a wider choice of meal planning. 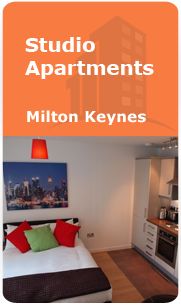 All apartments in Milton Keynes have a fully equipped kitchen and a dining area providing the perfect option to prepare your own meals, invite guests to dinner or to sit and enjoy a take-away meal. A city centre location also means you are close to one of two big supermarkets and a wide choice of restaurants and take-away vendors. 4. Close to many corporate offices such as Network Rail, Santander, Chamber of Commerce and BP Oil. This means that those on business travel have the option to travel by car, bus, taxi or to walk from their apartment, with the latter being a convenient and easy option. 5. We have one, two and three bed-room apartments with the choice of double or twin beds plus a sleeper couch in the lounge. This means colleagues, friends or family can share an apartment thereby cutting the cost of your accommodation. 6. Large lounge and dining area means there is space to work, dine or to watch TV. 7. All apartments are inclusive of Broadband and Sky TV. All our short-term apartments have their own secure parking bay at no additional costs. We pride ourselves on our flexibility, competitive rates and friendly service. Click below to see more details on our Studio, 1 Bed, 2 Bed and 3 Apartments. 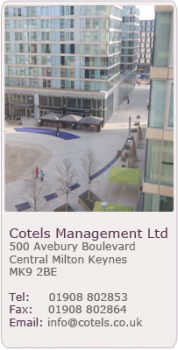 Cotels offer a wide range of apartments in Milton Keynes, which are ideal for corporate stays, business travellers, families, and leisure. They are also well suited as a temporary solution when in between house moves or relocating to the area. We have a range of locations to suit all tastes, budgets and requirements. We pride ourselves on our flexibility, competitive rates and friendly service.